The Banca d’Italia, a Eurosystem member, holds nearly 2500 tonnes of gold on its balance sheet and values it at market values where it comprises nearly 70% of the Bank’s total foreign reserves. Italy’s gold reserves are official owned by the Banca d’Italia and are not owned by the Italian State. The Banca d’Italia is co-owned by the Italian State and a wide range of Italian financial institutions. Italy’s central bank stores half of its gold holdings abroad, mostly at the Federal Reserve Bank of New York. This is concerning since Italy’s foreign held gold is not physically audited by Banca d’Italia’s auditors. Senators from Italy’s Movimento Cinque Stelle (5 Star Movement) political party have called for the Banca d’Italia to repatriate the Italian gold stored abroad, however the Bank of Italy has never commented on such a policy change. Historically, in the 1970s, Italy used its gold reserves as loan collateral for a huge national financing transactions provided by the then West Germany’s central bank, Deutsche Bundesbank. Italy’s claims to hold 2451.8 tonnes of official gold reserves making it the world’s 3rd largest central bank sector gold holder behind Germany and the US. The Italian gold is held and managed by the Banca d’Italia and the gold is also officially owned by the Banca d’Italia, which is a member central bank of the Eurosystem. The ownership structure of Italy’s official gold reserves is unusual among major gold holding nations in that ownership of the Italian gold resides directly with the Banca d’Italia and not with the Italian State. Ownership would not be an issue if the Banca d’Italia was fully-owned by the Italian State, but it is not. 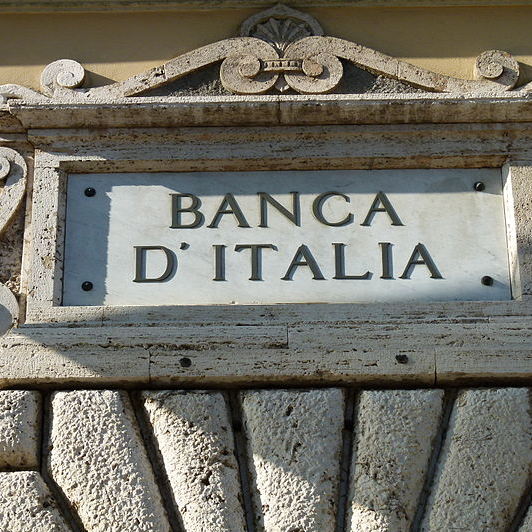 Unlike many other central banks, the Banca d’Italia is not fully state-owned, and its share capital is held by a cross-section of Italian banks and financial institutions as well as by the Italian State. Notably, in 2014, a number of senators from Italy’s Movimento Cinque Stelle political party called for ownership of the Italian gold to be transferred from the Banca d’Italia to the Italian public. According to the Banca d’Italia, 1199.4 tonnes of its gold, or roughly half the total, is stored in the gold vaults under the Bank’s Palazzo Koch headquarters building in Rome. The Bank of Italy claims that the majority of the remainder of the gold is stored in the vaults of the Federal Reserve Bank of New York (FRBNY), with the balance stored under the custody of the Bank of England in London, and with the Bank for International Settlements (BIS) at the vaults of the Swiss National Bank (SNB) in Berne, Switzerland. Therefore, the claimed storage facilities of the Italian gold comprise one domestic location and 3 foreign storage sites. Although the Bank of Italy does not provide data on percentage distribution of its foreign stored gold, it was stated in its 2014 gold reserves report that “the bulk” of its foreign stored gold is held at the FRB in New York, with only “contingents of smaller size” stored in London and Berne. Indeed, its possible to infer that nearly all of the Bank of Italy’s gold held outside Italy is stored at the FRB in New York. The Banca d’Italia’s total gold holdings have not changed materially since the late 1960s. At the end of December 1969, the Banca d’Italia only held approximately 12 tonnes of gold in London, which was the residual remaining after it had shipped most of the gold that was held in London back to Italy. Since the Banca d’Italia has stated that it does not engage in gold lending, it would never have had reason since 1969 to have gold stored at the Bank of England, so this 12 tonne figure would not be expected to have increased. Other central banks such as the Swedish Riksbank and the Bank of Finland only hold very small percentages of their gold reserves at the Swiss National Bank vaults, with percentage holdings between 2% and 7%. Applying a 2-7% range to the Italian gold held outside Italy, would give a figure of between 25 tonnes and 87.6 tonnes of Italian gold being at the SNB vaults in Berne. Adding 12 tonnes at the Bank of England in London, this would imply approximately 1,200 tonnes of Italian gold is held in the custody of the Federal Reserve Bank in New York. A figure of 1200 tonnes of gold at the FRB in New York would make the Banca d’Italia one of the largest central bank gold storage customers at the New York Fed. As a comparison, before the German Bundesbank began its gold repatriation programme in 2013, it claimed to hold 1536 tonnes of gold with the Fed in New York. The other very large official sector gold holder at the Fed in New York is the International Monetary Fund (IMF). This is because the New York Fed is one of the IMF’s four designated gold depositories. In the late 1970s, the IMF held approximately 70% of its gold holdings in New York. Applied to the IMF’s current gold holdings of circa 2800 tonnes, this would put the IMF’s gold holdings at the FRBNY at nearly 2000 tonnes. Given that the Bundesbank is taking an implausibly long 7 years to repatriate 300 tonnes of gold from the New York Fed to the Bundesbank’s headquarters in Frankfurt, a delay which suggests the German gold is either not in New York or is under various leases or claims, then it is very concerning that the Banca d’Italia stores the majority of its large stocks of foreign held gold at the exact same storage site in New York, a storage site which the Germans are having extremely difficulty getting a fraction of their gold back from. Despite the above, there have not been any official moves by the Banca d’Italia to initiate a gold repatriation operation nor even and official discussion of this possibility. According to IMF International Financial Statistics as reported by the World Gold Council, the Banca d’Italia has not purchased or sold any gold since at least the beginning of 2000, and Italy has maintained consistent gold holdings of 2,451.8 tonnes throughout this time. Therefore, although the Banca d’Italia has been a signatory to all four Central Bank Gold Agreements (CBGAs), the first of which took effect in September 1999, the Italian central bank has officially not sold any gold under any of these four Agreements. The European Central Bank holds just over 500 tonnes of gold, some of which is held in Rome at the Banca d’Italia vaults. This gold is held and managed by the Euro member central banks on a decentralised basis on behalf of the ECB. Although the ECB does not confirm how much of its gold is now held with the Banca d’Italia, it is probably anywhere between 141 tonnes (which was the amount of gold transferred by the Bank of Italy to the ECB in January 1999), and a lesser amount assuming some of the ECB gold sales carried out between 2005 and 2009 were done using ECB gold held in Rome. The Italian gold is held as a monetary gold reserve asset on the balance sheet of the Banca d’Italia and is valued at market prices in Euro. The gold is itemised as one line item of ‘Gold and Gold Receivables”. In 2011, the Banca d’Italia confirmed that this line item of ‘gold and gold receivables’ refers only to gold, with “no receivables”. In 2014, the Banca d’Italia’s press and external relations division refused to answer a question on whether any of its gold reserves were subject to lease agreements, swap arrangements or incumbrances or pledges. The Bank of Italy has only divulged information on the gold that its holds in Rome but not on any of the gold that it holds abroad. Of the 1199.4 tonnes of gold that the Banca d’Italia holds in the Palazzo Koch vaults in Rome, 1195.3 tonnes are in the form of large gold bars (95,493 bars), mostly 12.5 kg (400 oz) bars, and 4.1 tonnes are held in the form of gold coins (871,713 coins). The gold bars include London Good Delivery bars, US Assay Office bars, and even some old bars with the Nazi insignia. The gold bars held in Rome range in weight from 4.2 kgs up to 19.7 kgs, with an average gold purity of 996.2 fine. The Banca d’Italia claims that both the bank’s internal auditors and external auditors verify the gold stored in Rome on an annual basis. The Bank of Italy also claims that external auditors verify its foreign held gold stored in New York, London and Switzerland using annual certificates that the foreign gold custodians issue to the Bank of Italy. Therefore, the Bank of Italy’s gold stored abroad is not physically audited by the Bank of Italy nor by its external auditors. The external auditors merely check paper statements issued by the respective foreign storage depositories. This lack of physical auditing of foreign stored gold was one of the main criticisms that the German Federal Court of Auditors levelled against the Bundesbank in 2012 in its then confidential report, criticism which was partially responsible in prodding the Bundesbank to begin its gold repatriation program from New York and Paris in 2013. The Banca d’Italia operates representative offices in both Manhattan, New York, and in the City of London, England. It should therefore be a simple matter for the Bank of Italy to arrange physical on-site gold audits of its gold that is stored in both New York and London. The Bundesbank’s tardiness of repatriating gold from New York is one alarm bell to the Bank of Italy that its current shallow audit procedure is not adequate for such a vital and strategic reserve as the Italian nation’s gold.